This is the AD-6 Skyraider. You’ll notice in addition to four 20mm cannon, it has three large weapon stations, and twelve smaller ones along the wing and under the centerline. That meant it could carry quite a few weapons. The AD-6 was used by the Navy primarily as a medium attack platform. 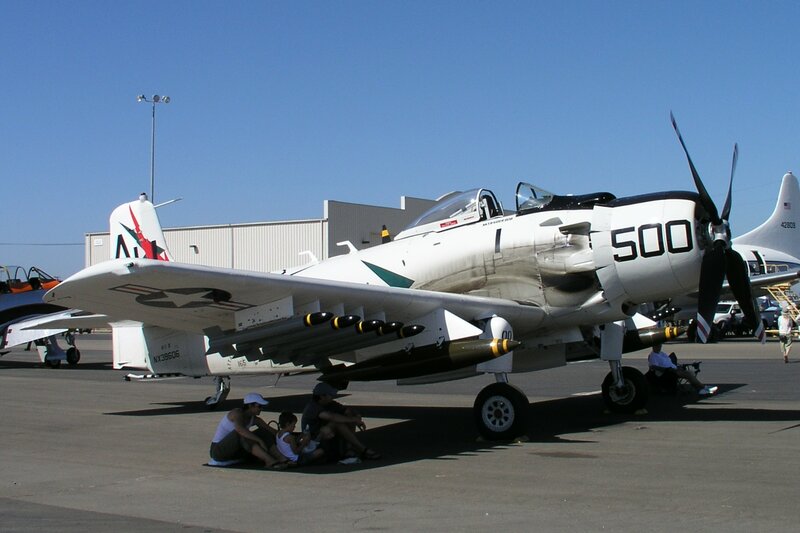 The other prime operator of the Skyraider in the 1950s, the US Marine Corps, used it primarily as a Close Air Support (CAS) platform. The large number of weapon stations helped it excel at the mission. But by the late 1950s, the AD series was clearly becoming obsolete, and the the replacement for the Skyraider, the light attack A4D-2/2N (later, A-4B/C Skyhawk) was entering service to replace it in both US Navy and Marine Corps service. As an aside, while designing the Skyhawk, Ed Heineman also designed a new series of conventional bombs to go with it. The Skyhawk is rightly revered as one of the best light attack aircraft ever designed. Indeed, it’s still in frontline service in Argentina! But in its earliest incarnation, a bright young Marine test pilot realized it wasn’t much of a CAS platform. It flew well, and could bomb accurately. It just didn’t carry much. The A4D-2 and A4D-2N only had three weapon stations. That meant a total of, at most, three bombs. For the Navy, that wasn’t a huge issue. They envisioned using the Skyhawk in the nuclear strike role. Two drop tanks, as seen above, and a nuclear weapon on the centerline station was just what they had asked for. But our bright young Marine test pilot, correctly guessing that future wars were more likely to resemble the recently concluded Korean War than Armageddon, sought a way to improve the Skyhawk as a conventional bomber. And the answer was, why not hang more than one bomb on a station? A simple steel rack and cabling harness would be the interface between one pylon, and six bombs. Captain Fitch set about designing just such a Multiple Carriage Bomb Rack. The Aero 20 pylon on each A4D-2 wing and the Aero 7 centerline pylon were part of the basic aircraft and were installed at the factory. The MCBR for the A4D-2 would simply attach to each of those pylons. The wiring system for the MCBR would be set up so that if the need arose during an emergency, you could jettison the MCBR with its bombs attached. That jettison would be accomplished by firing the secondary cartridge within either the Aero 7A or Area 20. With the MCBR attached to a pylon, the primary cartridge within the Aero 7 or Aero 20 would never be hooked up. Talking with the VX-5 avionics officer, he said that the wiring system for the MCBR could be done by VX-5 avionics with a simple wiring harness to be installed in the MCBR. . I had told him that the MC BR on the Aero 7A pylon would have six (6) HE or inert bombs attached to it. While at first I thought that there could be six (6) HE or inert bombs on each A4D-2 wing station MCBR, interference of the wheel well door would dictate that there would be only five (5) bombs for the wing MCBR.. All bombs on the MCBR would be suspended independent of the other bombs on the MCBR, using the Aero-15 racks from a crashed AD Skyraider. Fitch even received the patent for his design. Eventually, Fitch’s rather crude design would be improved, and produced as the Multiple Ejector Rack, or MER, capable of carrying six Mk82 500lb bombs. 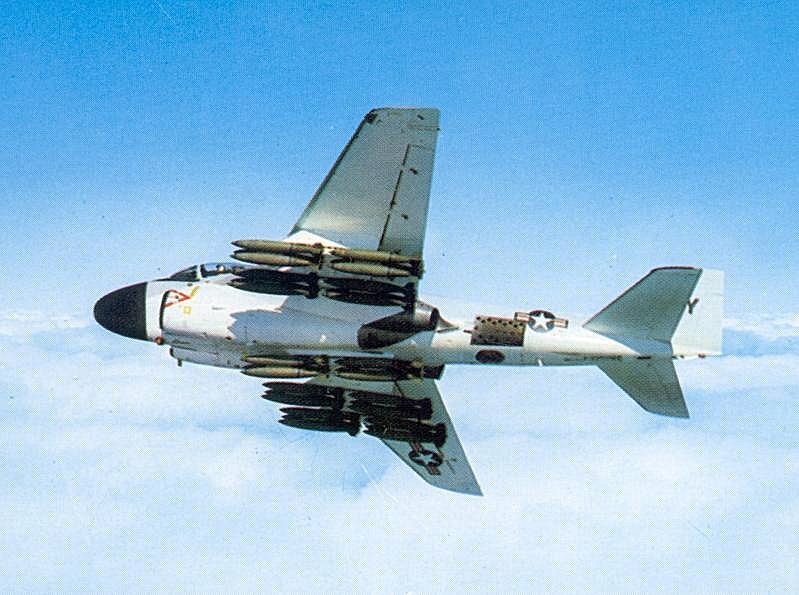 A similar Triple Ejector Rack could carry three Mk83 1000lb bomb, or three Mk82s. By using MERs, and A4D-2 suddenly went from carry three bombs to as many as 16. * And it wasn’t just the Skyhawk that benefited. Virtually every tactical aircraft in the Navy, and soon the Air Force, would be carrying bombs in multiples of three or six. The widespread use of precision guided munitions has actually lead to the near demise of the MER. Whereas before a strike plane might carry a load of, say, a dozen Mk82 bombs, today that same strike plane might only carry two or four JDAM bombs, mated directly to the parent pylon. But Fitch’s story of innovation and the support he received to develop a low cost solution to a problem the service didn’t even really know it had, should serve as a lesson to today’s leadership of how to empower junior officers. *Because of weapons clearance issues with the gear doors, the MERs on the wing stations could only carry five weapons apiece. 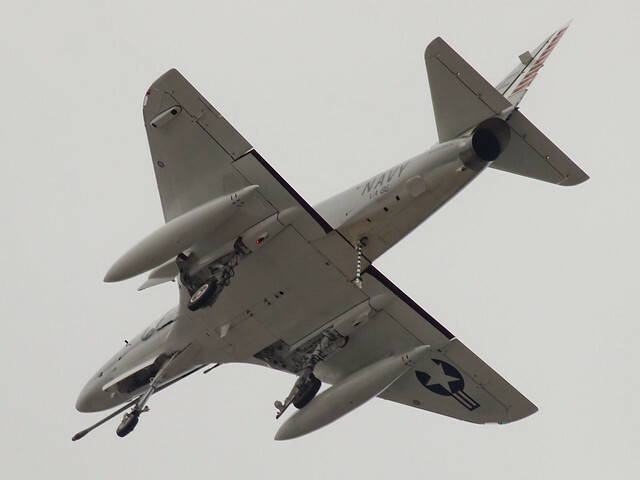 Author XBradTC2Posted on December 4, 2014 Categories marines, navyTags A-4 Skyhawk, bombs, marines, NAVAIR2 Comments on MERs and TERs. Good luck with that. My expertise is far more with blowing stuff up than in stopping stuff from blowing up. Author XBradTC2Posted on December 6, 2010 Categories stupidTags bombs, san diego11 Comments on There goes the neighborhood? Oh yeah, a little close air support…..